Out of the gallimaufry of Weblogs that I track in my categories in the columns to the right, one of my favorites is the Rev. Dr. Hunwicke's Mutual Enrichment. He is classed under the very few liturgical blogs ("Liturgi-cannon" in my jargon, also explained at the right) that I follow, and though he certainly excels at that topic, he frequently comments on Catholic matters, since he has left the Church of England to become a priest in the Anglican Ordinariate of Our Lady of Walsingham. So he could equally be classified among the more numerous (Anglo-)Catholi-cannon in the far right column, but I prefer to keep his link where it can be the crowning ornament in a far less crowded category. Today, Fr Hunwicke (the British like to dispense with periods after titular abbreviations) pointed us to another Catholic (that is, Anglican Ordinariate) Weblog of which I had, to my regret, been unaware before. It is called ignatius his conclave -- apparently the Brits don't always need capital letters, either -- and I commend it wholeheartedly to your attention. By scrolling down to the bottom of the blog's home page, you may begin with the earlier posts and proceed sequentially to the most recent one, at the top. You will be treated to a fine snapshot of the current consternation that surrounds the goings, comings and latest sayings of Pope Francis I on the topic of (among others) divorce and remarriage, and in particular, the Pope's refusal thus far to acknowledge or respond to five questions put to him by four senior cardinals, that asked him to clarify statements made in his most recent apostolic exhortation, Amoris laetitia ("The Joy of [Family] Love"). But you will also experience the gentle art of British satire, subtly practiced by a master. I have added it to my blogroll of (Anglo-)Catholi-cannon, where I intend to follow it regularly. After all, things in the Episcopal Congregations (i.e., ECUSA) have just not been as comment-worthy lately (we are still waiting on word from the courts in South Carolina and Ft. Worth!) as what has been happening across the Tiber. To be sure, the satirists like Christopher Johnson still have their occasional field-day with the utterly vacuous outpourings from those the Congregations have chosen as their spokespersons, but your Curmudgeon has lost his taste for a sport that amounts to shooting fish in a barrel. Likewise, the desultory coming apart of the Church of England (foretold quite some time ago on this blog, and again here) is no subject for either joy or sport. When looked at too closely, it generates only despondency. And as the Episcopal Congregations and Church of England go, so goes, as Dr Kirk of the newly linked ignatius blog puts it, the "Anglican soi-disant Communion", or Anglican Communion (so-called). The GAFCON group is struggling to preserve its core, but "turning and turning in the widening gyre, ... things fall apart; the center cannot hold; mere anarchy is loosed upon the world..."
So perhaps, drawing on the inspirations provided by superior bloggers like Drs Kirk and Hunwicke, your Curmudgeon will start a series of posts that tries to draw back and portray the wider picture of what is going on. Did Yates have a prescient vision when he wrote these words? For my local parish, I have been doing a series of presentations on "The End Times -- in Jesus' Own Words." Amid all the evangelical hullabaloo about the Rapture, the Four Blood Moons, the Shemitah and the like, it is a good thing to revert to the Most Knowledgeable Source and see what He had to say about His own Second Coming. I hope you will find the series instructive -- I will start working on it right away, and post as time permits. Until then, keep up to date by following the blogs linked at the right, and use the Guide to This Site to understand how we got to this point. Professor Helmuth Norpoth of Stony Brook University on Long Island correctly called this election for Donald Trump back in February, when everyone -- and I mean everyone -- was confident that Trump would lose by a big margin. Later in the season, he was joined by a different professor using a different model, but who went contrary to the popular trends and predicted the same result. 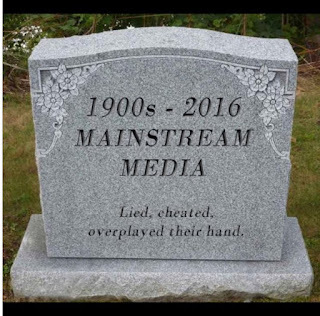 No, the biggest loser -- actually, losers (to use a term beloved of our President-elect) -- are (1) the Beltway elite; and (2) the mainstream media -- who gave it everything they had, and still fell way short. Exactly, Mr. Trudeau; exactly. Spot on. And I know you will keep it up. 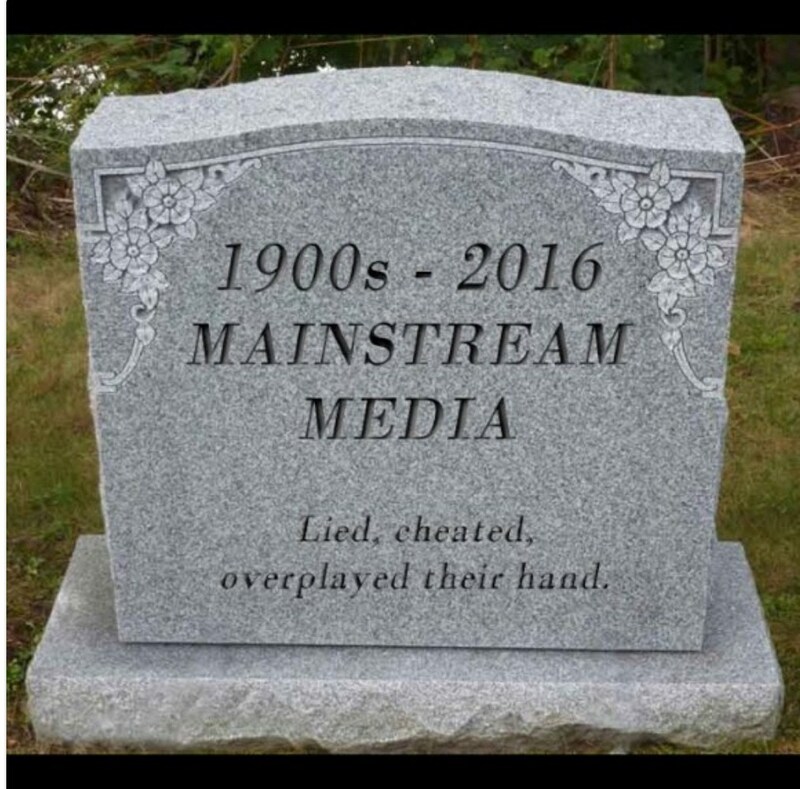 As will the second crowd of biggest losers, the mainstream media. The difference between them and the beltway elite, however, is that they will be unable to recognize how much ground they have lost. Starting tomorrow, it is child's play to predict the memes that will dominate the post-election mainstream media: "Trump will need to 'reach out' [one of their favorite mantras] to heal the divisions he has caused with this election . . ." "The world will become a good deal more scary with a Trump at the helm -- he could land us in a war with Russia . . .". "Trump will be bad for business and the economy, because no one can predict what he will do . . .". "Trump will destroy what it took President Obama so long bring about that is beneficial to this country: Obamacare, Dodd-Frank financial restrictions, environmental limits on growth and emissions, restraining global warming and the melting of the icecaps (remember the poor polar bears! ), bringing peace and security to the Middle East, putting Israel in its place, raising the minimum wage, solving the immigration problem, regaining the world's respect for our country in the United Nations and in foreign affairs . . ." and on and on and on, ad nauseam. It is my dearest hope that with each repetition of these vacuous liberal mantras, the mainstream media will lose ever more and more of their readers and listeners, to the point where they, too, will have to look around for other lines of work. And last but not least, James Comey's stalwart agents in the field may finally be able to investigate some people worthy of their attention: start with Comey's former boss, Loretta Lynch, and her attempts to squelch the ongoing investigations into Hillary's violations of our secrecy laws; move on to Patrick Kennedy and the whole corrupt bunch at the State Department who lied about Benghazi and then have been enabling and hiding Hillary's outrageous and dangerous disregard for our security; then to the IRS and its illegal targeting of conservative non-profit groups; then to Eric Holder and his scheme of gun-running, while also letting others get away with voter intimidation; and ... oh, yes -- did I mention a certain former Secretary of State? And her husband? Who together enriched themselves by selling access and favoritism at this country's expense? And broke all the laws about charitable organizations in the process? Who knows where all this is going to lead, indeed? Certainly not the entrenched elite, nor their lapdogs, the mainstream media. Mind you: I do not blindly endorse Mr. Trump and his ways. (Indeed, I agree with C.S. Lewis, who once wrote: "Of all tyrannies, a tyranny exercised for the good of its victims may be the most oppressive. It may be better to live under robber barons than under omnipotent moral busibodies. The robber baron's cruelty may sometimes sleep, his cupidity may at some time be satisfied; but those who torment us for our own good will torment us without end, for they do so with the approval of their own consciences.") Mr. Trump will have to mind his manners a lot more, and surround himself with advisers who are much more knowledgeable than he is in particular areas. But that is what businessmen who are promoted to head up major corporations traditionally do. No, what I am celebrating tonight is the radical shakeup of the Washington establishment. They have needed it for a long, long time. And no one can assure us that a shakeup of this magnitude will be totally beneficial in all ways -- some things that are truly good may perish along with so much else that is so bad, and deserves to come to an end. As I have maintained throughout this campaign, America is under God's judgment -- which is why we were presented with the Hobson's choice we had. We are not out from under that judgment yet, because America has not yet turned back from its ways, and repented of its manifold sins and wickedness. Whether it will do so under its new government remains to be seen. So fasten your seatbelts. It's going to be a riveting ride.